(This is the first of two entries about standards and the crucial role they play, and will continue to play more and more, in bringing greater compatility and peace to the world. For the past 35 years I’ve been working with computer and telecommunication engineers, helping them document their work not only for end users of the products they develop, but also as roadmaps that the engineers themselves use in the course of development. I’ve seen first-hand how standards in the computer industry are one of the indispensible elements that have made today’s miracles of cell phones and Internet possible. This first article discusses those standards in a very basic and (hopefully) interesting way. The deer picture and the soundwave picture were borrowed from the Internet. The other text and art are of my own making. The next article, which I hope to post next week, will describe how global standards can and should be applied to all facets of human endeavor… including human spirituality. The bits are arranged into groups of eight (called “bytes”) that are further arranged in strange ways and given strange names. 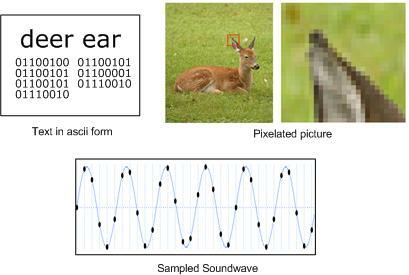 Text becomes “ascii,” pictures become “pixels,” and music becomes “sampled audio” that streams at a rate of 1.4 million bits per second through computer circuits before being converted back to continuous audio soundwaves that our ears can enjoy…. In effect, everything in the computer world is blown to bits and reorganized… very, VERY quickly. To send this ocean of bits among telephones, computers, and other devices through the Internet and the many other networks around the planet without jumbling things up or losing stuff (or, as engineers say, “dumping it in the bit bucket” or “losing it in a black hole”) the information is kept tightly organized. Whether the bits and bytes are arranged as frames or packets or synchronized bitstreams and bytestreams, it always follows strict standards. Without standards, computers and phones wouldn’t be able to talk to each other. Radios, TVs, printers, FAX machines, and countless other devices wouldn’t be able to plug into the vast repository of human knowledge flowing around the planet today through the Internet. Following the history of communication, from the development of the Phoenician alphabet 5,000 years ago (which emerged from alphabets in the long-buried past), and the first postal service in China 3,000 years ago, the first printing presses in China 2,000 years ago, and the first newspapers nearly 1,000 years ago, the first big communication network to start reshaping humanity was the telephone network, developed a mere 100 years ago. Since then, communication networks on Earth have been coming together like the neurons in a fetal brain. Most of the telephone switchboard operators retired in the 1960s, when area codes were assigned everywhere for automatic switching, and something called “circuit switching” became the standard in the telephone industry for a couple of decades, sending information around in “frames.” When computers began to send massive amounts of information to each other, a more efficient standard was needed, and “packet switching” was adopted. Circuit switching is a single stream of information… kind of like a train on a railroad track. Packet switching breaks a big piece of information into small bundles and sends them all out through a complex network… like cars and trucks through a nationwide highway system, each taking its own course to the destination. A T1 circuit is like a train track dedicated to a continuous flow of trains (frames). Each train has been assembled at the source (left) from 24 simultaneous phone conversations. Each train has 8 “cars,” each containing 24 bits or channels or time slots. An additional “framing bit” is like an engine. The 193 bits make up the T1 frame. At the destination, the 192 bits of audio and data are unloaded from the cars and reorganized into 24 bytes or octets. Each bit from each car is joined with its associated bits from the other 7 cars. As 8,000 trains pass by every second, related bits of each car of each train are recombined into audio-data streams, allowing multiple phone conversations to be underway at the same time. 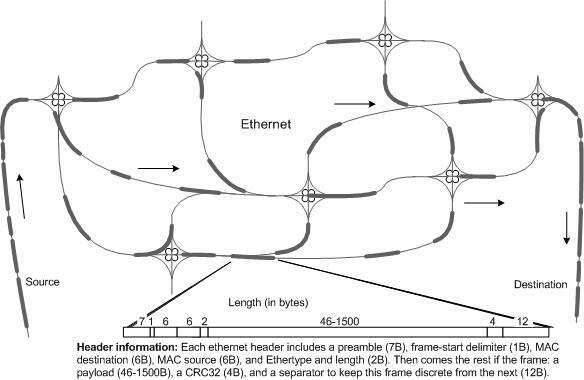 Ethernet looks more like a highway system in which a single stream of traffic (data) is split into many “vehicles” (frames or packets) of various sizes. The packets go streaming from the source to the destination through any available cloverleaf interchanges (network switches) by any accessible route across the network. The packets have innate knowledge, in the form of header information, of how to reassemble into a data stream as they approach the destination. So I hope from that you can get at least a general idea of how standards have played a key role in making modern communications possible. Next week we’ll see how standards could bring greater compatibility to almost all fields of human endeavor… bringing us ever closer to a world of peace and understanding among people, cultures, religions, and nationalities everywhere. This entry was posted in About Mark Macy, Our ancient heritage, Our paradise destiny, Politics and Economics, Science and Technology, Society and ethics, Worldly matters. Bookmark the permalink. Yes, I have always been “blown to bits” with the miracle of technology, mobile phones, computers; I still have a feeling of awe and wonder. Recall some years ago now, holding a cordless phone in my hand and making bookings to a hotel in Reykjavik, Iceland, speaking directly to a voice so far away. I was completely overcome by the “magic” of it. If only I could show the people of just a couple of generations ago this incredible communication facility. It would not be believed. It would be considered impossible. It is of course the real magic despite technological explanations. So (to me) the idea of an afterlife or the reality of that is no more incredible or unbelievable than talking with a tiny instrument in my hand across thousands of miles. It’s all wonder, wonder, wonder. Your article so interesting and explanatory. Thank you. I know! Telling people a century ago that we can open a little gadget today and talk to someone across the ocean, they wouldn’t believe it. Today my ITC colleagues and I tell people that a century from now–even maybe a decade from now–we’ll be able to use similar devices to talk to someone across the veil… stirring up the same skepticism.